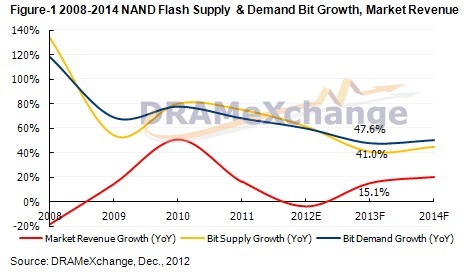 Overall NAND Flash bit demand growth to reach up to 47.6% YoY. With regards to the NAND Flash supply side, it is predicted that the 12-inch wafer production growth will be approximately 4% in 2013. Should next year's capital expenditure turn out to be 22% lower than this year's, the overall bit supply growth is likely to be around 41% YoY. With market supply-demand balance, NAND Flash ASP is estimated to dip by 22%, which is significantly less than the 39.7% drop exhibited last year. On the supply side, manufacturers have been facing a lot of pressures following the major NAND Flash price downtrend caused by the 1H12 oversupply. During July, Toshiba announced it would be implementing a 30% production cut, whereas the other manufacturers opted to put a temporary halt to their capacity expansion plans. As TrendForce indicates, for 2013, NAND Flash supply vendors will continue to have reservations about the future market prospects. With the proportion of the 20nm production process set to break the 80% mark and expected to fulfill the majority of market demand, the attitude towards the prospects of new production processes is noticeably even more conservative. For 2013, TrendForce estimates that annual wafer production will increase only by 4% compared to this year, with around 1.2 million units being the 12-inch wafers. 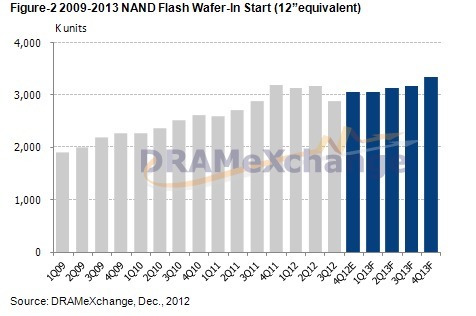 On the whole, the 2013 NAND Flash bit supply growth is set to be 41%. On the demand side, benefiting from the growth exhibited by mid-to-low end models, the 2013 smartphone shipment is expected to climb from 674 million to 892 million units, a 32% increase. Other than the support of eMMC by high-end smartphones models, many mid-to-low end smartphones are beginning to show increased improvement in their hardware specs. The eMMC penetration rate within the smartphone market, as such, will likely grow to 66% next year, and even break the 70% mark. In spite of the hype surrounding the iPad4 and iPad mini, Android and Win8 tablets are closely catching up in terms of popularity. In 2013, tablet shipment growth is expected to grow by 44%, increasing from 100 million to 143 million units. The increase of eMMC density, on the other hand, is expected to rise in accordance to consumer need. TrendForce predicts NAND Flash consumption for tablet PCs to be 50% more than the amount in 2012. Although TrendForce initially predicted stalled momentum for the 2013 notebook market, with the support from Intel and the PC ecosystem, along with the decreased costs for various key components, ultrabook penetration rate is predicted to go on a gradual increase, climbing from 6% in 2012 to approximately 18% in 2013. Shipment volume, similarly, will likely show more than three times the growth next year compared to 2012. The NAND Flash 2013 consumption rate, as a result, is projected to exhibit vast improvements, with a possible growth exceeding 65%. Assuming that demand momentum is certain, and that supply is properly regulated, a stable growth is projected for the 2013 NAND Flash industry. The NAND Flash output value is likely to revert from negative to positive, growing by 15% to $24 billion USD.